Didn’t I say, "Don’t sit with sad companions?" Since you are in the garden, don’t go to thorns. Couple of weeks back back I was blessed to sit in a circle of Rumi lovers. This was Threshold Society’s weekly reading / sufi gathering, somewhere in North London. 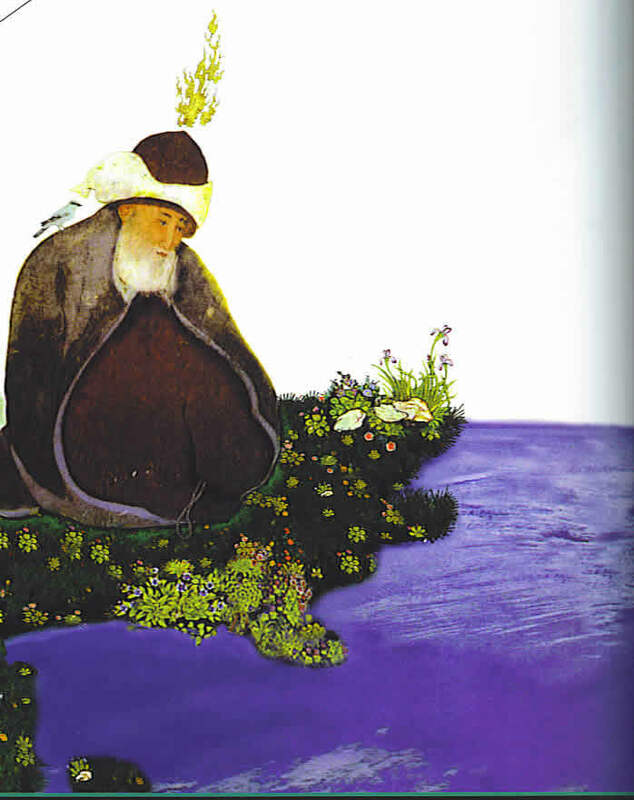 Threshold Society is one of the contemporary guardians of timeless wisdom of the Sufi Mystics as transmitted through the great guides such as Shams Tabrizi and Mevlana Rumi, may God be pleased with them. The group is one of the many circles / gatherings who come together on weekly basis and under the guidance of their present lineage carrier, Shaikh Kabir Helminski. Such circle of gathering generally offers zikr (remembrance), reading, meditation and heart sharing. Shaikh Kabir who is presently based in Northern California, USA was honored back in 1990 with the title and responsibility of Mevlevi Shaikh by the late Dr. Celaleddin Celebi of Istanbul, Turkey, head of the Mevlevi Tariqa (Order) and direct descendant of Mevlâna Jalâluddîn Rumi (21st grandson). What is read and meditated upon is instructed by the Shaikh every week and the group later on shares from their perspective. "...Begin with a short reading. Let each person in the circle speak in their turn, from their heart, sharing either concrete observation of their own lives and experience, or an insight. If someone feels they have nothing to communicate from their heart they may pass. What is spoken is from and for oneself, never a commentary on or reply to another person’s sharing. Each person in the circle should be their own “editor.” The best words are, generally, few and from the heart. Each person should practice the art of listening without judgment. Gradually communication, trust, and mutual respect should deepen"
The gathering in London in which I went are hosted by individuals, mostly at their living room. In North London it was one such gathering of the lovers of Rumi in the spirit of Mevlana's invitation: "Come, come, whoever you are. Wanderer, idolator, worshiper of fire, come even though you have broken your vows a thousand times. Come, and come yet again. Ours is not a caravan of despair" - such gatherings still function as the pointers of humanity's thirst for sacred sharing and coming together to remember the Real. Such circles and those who hold these gatherings are also guardians of coming together of humanity for the Sacred alone, something which is increasingly lost in this world of chaos, speed and more chaos. It was post Christmas time and about ten or twelve person joined in. In the beginning there was silent zikr (remembrance) using Mevlevi Wird. In Sufi tradition Wird is the word used for certain prayers that are recited, and also the word used for supply of water to which one goes to refresh and sustain themselves. Its purpose is Zikr Allah, Remembrance of God and purify the seeker from everything other than God. Different Sufi Path may adopt different Wird based on the Teacher's own realization and gift of blessing and each seeker may be given different Wird as well when needed to do special inner work or activate particular conscious center. Threshold Society at the moment for common Wird uses certain Sacred Names of God and Sacred formula and in the group this is repeated in a number of time, first in silence, personally and then in audible way together. The effect on the heart is beautiful and remembrance of God in circle is always nourishment for the soul. After silent remembrance we read a certain reading from Rumi which was part of a long work on the self (nafs). After the short reading, we meditated silently and then came up the turn of sharing from the heart. While meditating in the moment at the gathering, the sacred formula "La ilaha illaAllah" was coming to my mind - which is also part of the Mevlevi Wird recitation and with that in mind I was looking at the message from Rumi and what came to me is that the message was like a commentary on the sacred formula. To the Sufi Gnostics the statement "La ilaha illaAllah" encapsulate the totality of reality. 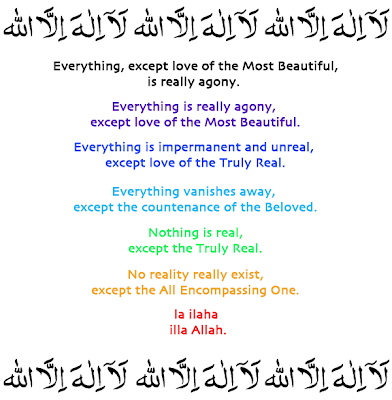 From Non-dualistic point of view nothing else can be said after la ilaha illaAllah because it says everything - there is no other divine reality except the One Reality, nothing in reality really exist except (by, with, for) Allah. So to me as I was reading what Rumi said: "Everything except love of the Most Beautiful is really agony" - one understand of course that the Most Beautiful refers to the Sacred Name of God: al-Jamal - the Most Beauteous One, the Most Beautiful - that is God and the only love which is real is Love of God - every other love is only a reflection of the thirst, of our innate longing after the Real Love (of God) - and thus amnesia of the Real Love brings agony because it wants to grasp that which is non real - thus it becomes agony. 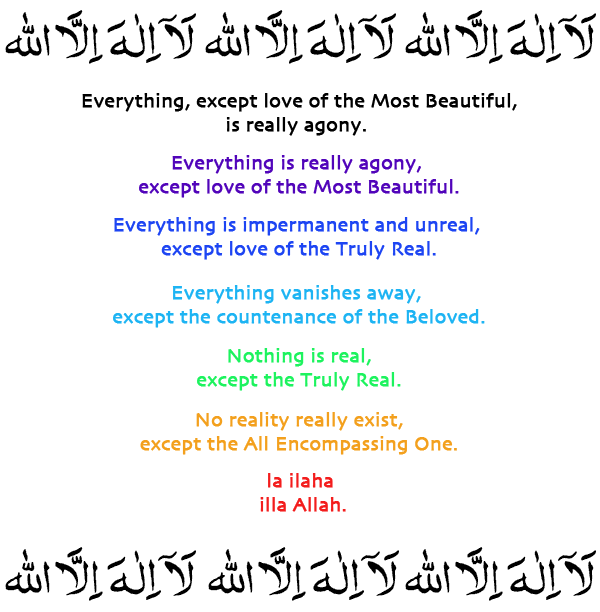 Here "Everything except..." part is like "la ilaha illa" and "love of the Most Beautiful" is like "Allah" - the Divine Reality which is indivisible in Its essence, the Unqualified Oneness. Going further with Rumi where he says, "Let him set his rubbish ablaze with ... fire." It is like the remedy / teaching instruction of Rumi, who like other sufi masters is a physician of the heart and soul, giving us the right medicine for the sickness. Sufis often talk about using the part of "la ilaha" as the sword of Truth (al-Haqq) and to use it to banish every illusion of the mind other than the Real. The Mystic Master and Grand Sultan of Sufis, Muhammad Mustafa instructed and trained his holy companions to recite "la ilaha illaAllah" to renew their faith and certitude and refresh it. And he said, "I and the Messengers before me have said nothing superior to La ilaha illa Llah". And "la ilaha illaAllah" is the best of invocations and the best of deeds. The people who most benefit from my intercession are those who utter it with sincerity. No servant utters it, and then dies still upholding it, but that he shall enter the Garden; even were he to commit adultery and theft but shall be forgiven and forgiven." And he said, many blessings and peace be upon him, speaking on behalf of his Lord, Mighty and Majestic is God, "la ilaha illaAllah is My fortress, and whosoever enters My fortress shall be safe from My torment." For a new seeker on the Path, the first zikr or remembrance formula which is given is exactly this, "la ilaha illaAllah" and is asked to recite it abundantly. It helps to raise one's spiritual station and accelerate soul's journeying towards its Homecoming. From the perspective of Marifa (the Higher Knowledge of God), everything other than God is unreal and hence impermanent and attachment to impermanent is the sole cause of suffering and agony and hence everything except the love (and real love comes from pure gnosis) of the Most Beautiful One is agony. And to cut through the illusion one is told to set all rubbish ablaze (ghayru'Llah, every veil between the lover and Beloved) with fire. Nothing is in my heart except the Divine.